It doesn't matter if you have years of experience or are just embarking on your career path - finding your voice and being confident at work isn't easy to master. When in meetings with the higher-ups, it can be hard to know if your voice is being heard or how respected you are in around the office. Knowing the answers to these questions often isn't something that's said but a difference in the way you are treated. Being respected as an expert in your field, and branding yourself as a reliable professional takes consistency and confidence in everything you do. Giving a presentation to your office, team or C-suite executives is a big step in your career. This can be to present the work you did on a project that went well, pitching new ideas, presenting concepts to clients, etc. This will build up your public speaking muscles and teach you how to communicate clearly and answer tough questions under pressure. From prep to feedback, there is so much to learn and gain from presenting in the office. This can be hard, but the lesson here is to build a case for the value you add. Asking for a raise or any other accommodation at work will help you build confidence because it will require you to speak on what makes you unique, how to contribute to the company, and will prepare you for future conversations. After your first negotiations, you will only get better. If you have a new idea about how the company can operate more effectively or even new responsibilities you'd like to take one, learning how to make them happen will definitely build your confidence. You'll have to put together a business case, or have a serious conversation with your boss, and this will only better prepare you for a promotion or conversation with future employers. Go to an industry event. How can attending events help build your confidence? When you attend events, it forces you to get out of your comfort zone and network. Also, the trade tips you learn from other industry leaders will give you more insight to performing your job better. Not to mention, it will inspire you to become a public speaker and get booked to share your expertise. Mentoring someone can be one of the most rewarding experiences. It also gives you a boost of confidence when you think about how far you've come, and the lessons you've learned. Let's be honest, when you look good, you feel good. Take your time revamping your wardrobe to become the woman you've always dreamed of being. Whatever it that makes you feel more powerful; wearing makeup, high heels, new hairstyle - do it, and watch what a difference it makes. Similar to pitching a new idea to your boss or a client, finding new ways to optimize business process will take moxie. Learning how to clearly communicate needs and the effects of not getting the right resources will strengthen your negotiating skills and ability to anticipate problems. If there's anything you ever wanted to learn or a skill that would make your job easier, get trained in that area. Once you are learing new skills, and perfomring better in your role, you'll start to feel more confident in meetings and in 1:1 with your boss. Meet with someone from another department. Your network is really your net worth. Build your confidence by knowing you have a network to support you when you need it. Get to know people from other departments. Having a support system is a great confidence booster. Confidence can come from when you know people respect you, and also when you know people genuinely like you. Smile around the office, make jokes and get to know your coworkers. When you get asked to go to lunch, take the offer. This is where you'll find out about things happening in the office that aren't talked about openly, these insights can help you to better navigate your career at the company. 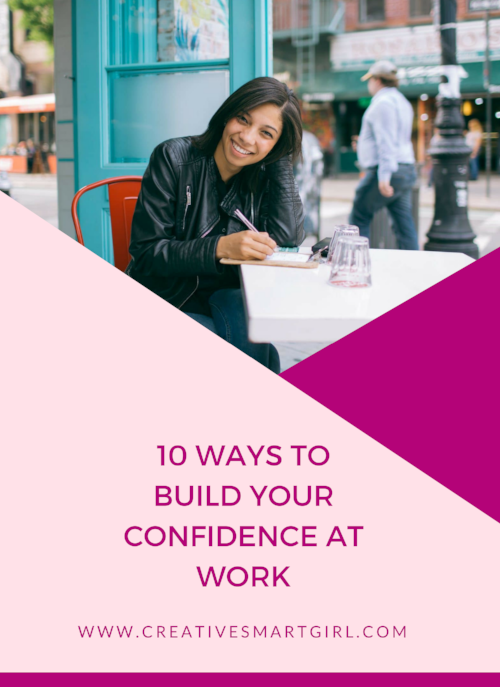 What are some ways you've built confidence in the workplace?